Online DIY store Screwfix.com is still having problems filling its orders despite taking on more staff. The company has blamed staff training for its latest delays, saying "picking and packing staff are still learning the most efficient way" to do the job. Three weeks ago, Screwfix stopped orders altogether in the face of a staff shortage at its new warehouse. That problem is now "more or less" resolved, but huge demand is still overwhelming workers in Stoke-on-Trent. The group moved its warehouse from Yeovil earlier this year, saying that the new location would be more central for sending out its products. While staff are managing to get orders out, the firm has had to limit those taken to ensure that the operation is not overwhelmed. "We have every confidence that the issue will be resolved by Christmas, " spokesman Nigel Cope said. He explained that a new server on its website meant orders can now be accepted more quickly, contributing to the deluge facing its inexperienced staff. "Customers, having seen the situation, are now logging on earlier to get their orders in early," something which is exacerbating the problem, he added. By 1100 GMT on Tuesday, Screwfix had already stopped taking orders for the day. "Everyone is working flat out to bring our new warehouse up to speed, but in the short term we are not able to meet all of our usual demand," managing director John Allan said on the group's website. "We are now handling double the number of orders that we were three weeks ago and are making steady progress towards being able to keep Screwfix.com open all the time." Mr Cope added: "The business is making progress in terms of resolving the problem, and the number of orders have doubled." Huge demand actually meant that the firm took a record number of orders on Monday, he said. Screwfix claims to be the UK's largest online supplier of DIY, with more than one million customers. It supplies goods to the DIY trade and keen home improvers using catalogues, the internet and the telephone. 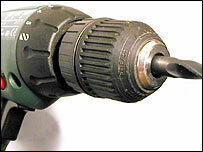 The firm sells hand tools and power tools at trade prices, offering next day delivery at wholesale prices. Screwfix is a specialist division of Kingfisher - owner of B&Q - and racked up an annual turnover of £187m in 2002-2003.